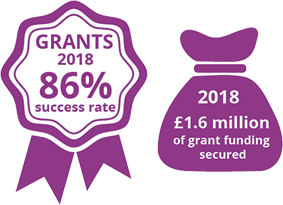 The EEF’s grant funding tests the impact of high-potential projects aiming to raise the attainment and wider outcomes of 3-18 year-olds, particularly those from disadvantaged backgrounds. We do this to find out what’s most likely to work effectively and cost-effectively, and to put that into action across the country. Have you got a high-potential project that aims to raise the attainment and wider outcomes of young people aged 3-18, especially from disadvantaged backgrounds? If yes, we hope you will consider applying to our current general grant-funding round. We are interested in testing the effectiveness of projects through rigorous, independent evaluations. Those that show an impact we will then support to scale up to improve outcomes for other disadvantaged children and young people across England. a rigorous evaluation of the project, as randomised controlled trials where appropriate, which usually includes an estimate of its impact on attainment and other outcomes. We also fund an implementation and process evaluation to understand how a project is implemented on the ground and the elements of successful delivery. The final evaluation report will be written by an independent evaluation team, but our grantees share responsibility for ensuring that the evaluation is as robust as possible.